I always look forward to making all our favorite Thanksgiving dishes. Sweet potato casserole is my absolute favorite, but this year I've found a new way to use those sweet potatoes. 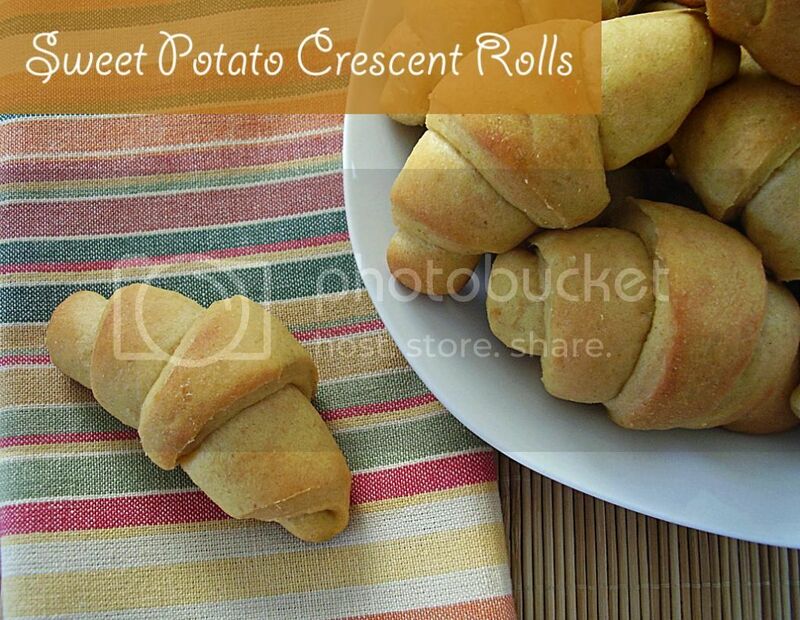 These soft, delicious rolls will be a welcome addition to our Thanksgiving table. 1. Proof the yeast: In a small bowl, mix together 1 cup water, 1 tbs. sugar and yeast. Cover and let sit for 10 minutes. Yeast should be foaming and bubbly. If yeast is not foaming, then water was too hot or cold or yeast was too old. Try again using a thermometer to measure the temperature of the water and make sure the yeast hasn't expired. 2. In a mixing bowl, beat together yeast mixture, sweet potato, butter, egg, salt and whole wheat flour. Add enough white flour to make a stiff dough. 3. Knead on a floured surface, about 6-8 minutes, until smooth and elastic. Put in a greased bowl, turning to grease the top. Cover with plastic wrap sprayed with cooking spray and let rise until doubled, about 1 hour. 4. Punch dough down and divide into four equal portions. Roll each portion into a 12" circle and cut into 12 wedges. 5. Brush with melted butter and roll each section starting with the wide end. Place pointed end down on a greased baking sheet, keeping the rolls about 2" apart. Cover with a towel and let rise until doubled about 40 minutes. 6. Bake at 375 degrees for 13-15 minutes or until golden brown.